Back in mid June, I was able to get out for an entire weekend during my busy summer schedule. The weather had been fantastic for most of the week and it definitely didn't disappoint for the journey. 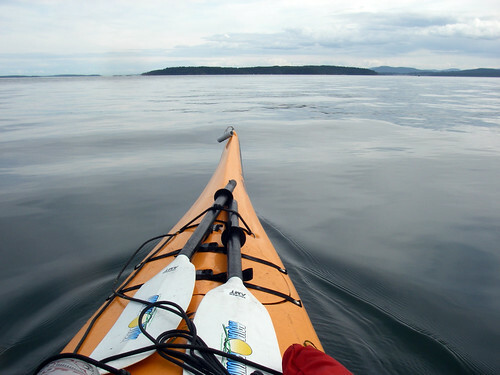 I was paddling solo out to Portland Island to meet up with some friends from West Coast Paddler. The plan was to get to Portland Island and find out where some of the other people wanted to go once we got there. 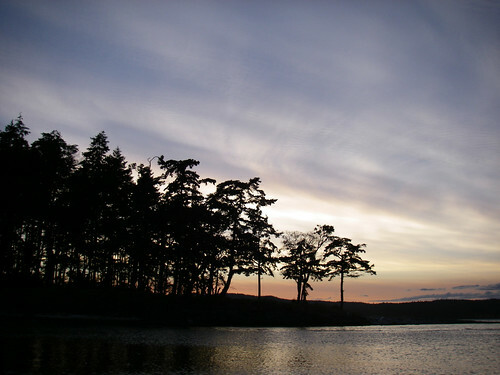 I put in at Roberts Bay right after work and paddled briskly to Swartz Bay with a couple of daylight hours left to spare. It ws when I got to the point of Goudge Island when the winds began to pick up. The wind rose sharply from the lazy 5 knots in Sidney to gusty 15 knot winds in the bay. The water was a lot more disturbed too. 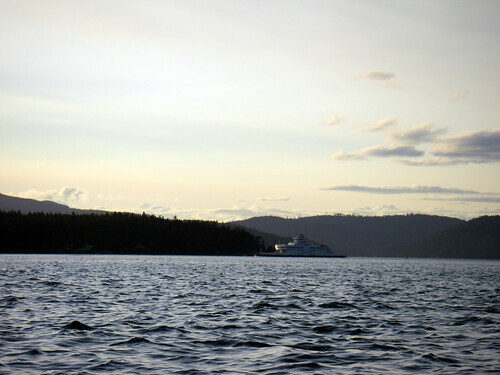 I waited for the Tsawwassen to Victoria ferry to pass and worked hard to get to Pym Island. The wind and waves along with a nice stiff current were making the going pretty slow. Things got a little hairy in between Pym and The south shore of Portland Island. whitecaps and fairly confused water was pushing me all over the place and the wave size was amplifying pretty heavily at Hood Island, just off Portland island's southeast tip. 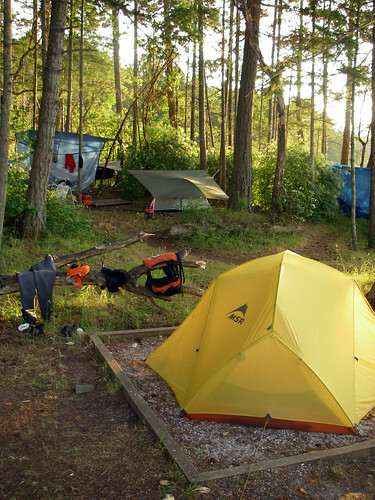 I made it into the protected area of princess bay and paddled up to the arbutus campground, where the wind remained well offshore. After that nice challenging paddle, I was met by Greg and Willi on the beach and set up camp under a beautiful sunset. The next morning dawned bright and warm with a low tide. Willi and I wasted no time having breakfast and getting out on the water. Greg hung back and relaxed on Portland. We made up our mind to go out to Ganges Harbour on Saltspring Island to enjoy the Saturday market and then out to Prevost and back to camp. The water was flat calm all day and the clouds would come and go giving us some nice relief from the sun. Saltspring's coast is fairly rugged offering very few places to take out and a lot more boat traffic than I was expecting. We crossed from Portland to near Ruckle Park and then headed north along the coast while chatting back and forth. 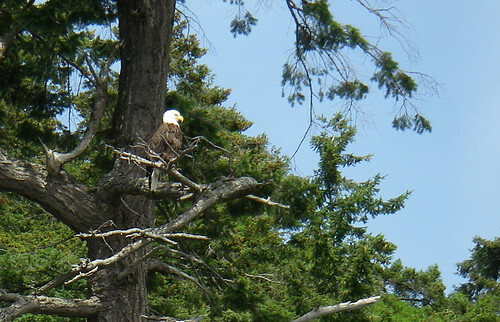 Wildlife was plentiful out here - we saw a few huge bald eagles, some porpoises and seals. Fish fry were also everywhere in the water. 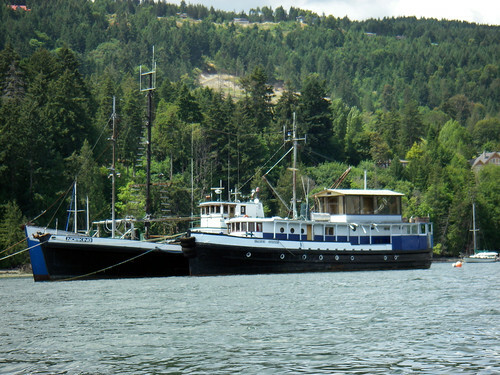 We got to Ganges Harbour around 1pm and had to pull our boats out at the boat launch and place them up on shore. After securing the boats, we headed into town to get some food and see what everyone was up to. The market was busy as usual and kids were having a great time running around and being kids. I found some sugary fudge and a hotdog - I didn't way Kayaking had to be healthy :) Willi and I found a great place to rest on the cool grass just behind the market. 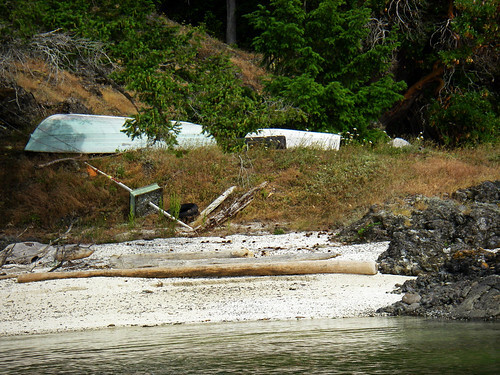 We bid goodbye to Saltspring and retrieved our kayaks from the rocks. The tide had come up quite a bit, so I ended up wading to them I go mine back to the boat launch ramp to get in and turned around to find WIlli soaked with water - Darn! missed him falling in :) We finally got our act together and put in, heading up the northeast side and into the Goat and Sister Islands. These tree lined little islands are just teeming with high end real estate. Beautiful houses with their own private docks and power just chiseled into the wilderness. 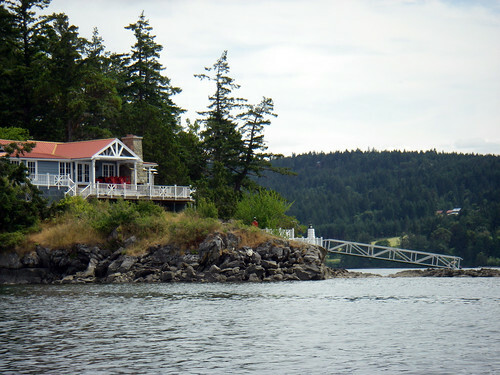 As we left these little islands, the Long Harbour ferry passed by and we saw the west side of Prevost island. Will and I split up at this point. I continued down the west side, and he went up and around the tip of the island. The paddle back to Portland Island was stunning. 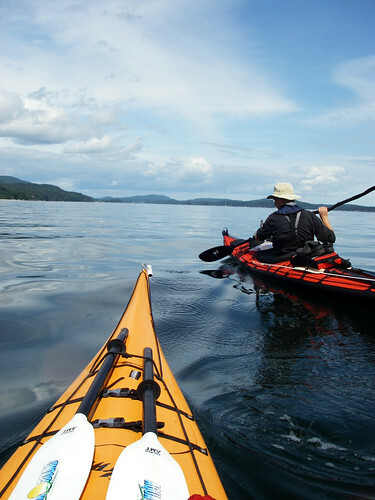 There are so many inlets and islands surrounding Prevost that make it a great paddling spot. The property lines on the island extends down to the tide line with most every beach prominently displaying a private property sign. I paddled back along the same route to camp, where I met Greg. 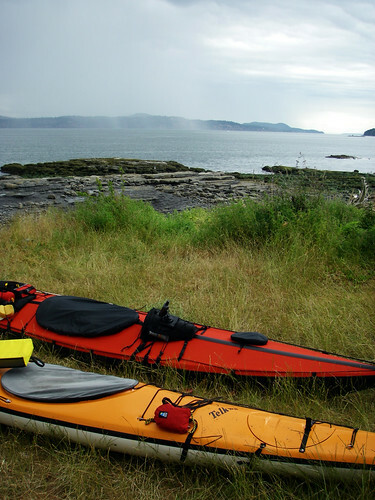 Just as I got the last layer of paddling gear packed away , Will paddled into shore and we both sat down to a bowl of soup that Greg had prepared after his hike around the island. What a great guy! The rest of the evening was spent relaxing on he beach and enjoying the warm weather. The rain cleared out just minutes later leaving a nice hot day to enjoy. Today the current was opposing me fairly strongly and the wind was pushing me a bit off course. It was a bit of a treadmill, but the paddle home was really beautiful and mostly calm. Roberts bay was still at a nice high tide, so I packed up and left Sidney for another time. This blog contains my logs for time out on the water and inside news on events that I'm following. 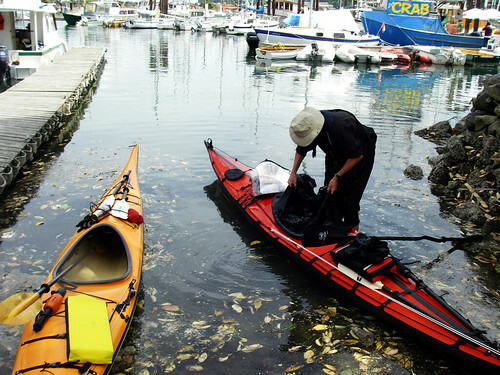 Whether it's local paddling, traveling or yachting, you'll	find the stories here! I live in Victoria, British Columbia. It's on the south coast of Vancouver Island in Canada. 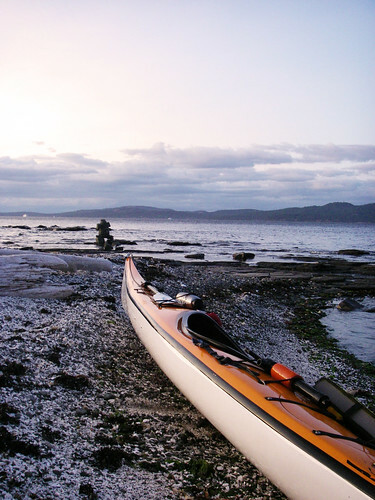 I paddle an 18'3", Orange decked Nimbus Telkwa as my regular kayak. See you on the blue stuff!